Techland needs more time to make Hellraid a bigger and better game. 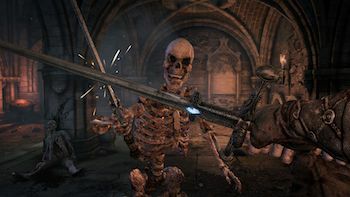 Hellraid, the first-person fantasy action game from Dead Island developer Techland, has been delayed until 2014, the studio announced on the game's blog. According to the post, the team decided it needs more time to "add new features and completely new game modes for single player and co-op." Although the game could have been shipped in 2013, Techland feels the current version of the game "probably wouldn't meet all our promises and your expectations." Player feedback also played a role in Techland's decision. Allowing fans to try the game at Techland HQ, received "a lot of fresh insight and new perspective." That feedback has apparently led the team to rethink some of the game's systems. More specifically, the team intends to "add new ways of casting spells and a set of new, more visually stunning spells." Based on the number of issues the team needs to address, it doesn't sound like this game is going to be ready for awhile. Techland says they will release Hellraid on PS3, Xbox 360 and PC "when its done," which they expect will be sometime in 2014. If you want to learn more about the game, you can check out Edyn's Escape, an interactive prequel/trailer that will start to clue you in on what Hellraid is all about.